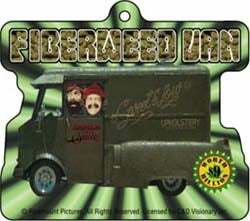 We can't be sure that this air freshener, inspired by the Stoniest Vehicle In Motion Picture History, actually smells like reefer. But we can guarantee the smell won't matter as soon as a member of the law enforcement community takes a look at this thing dangling from the mirror of your vehicle; regardless of actual circumstances, you might as well have an eight-tube hookah stuffed with a pound of hash-oil-drenched Northern Lights smoldering away on the dash and a pair of tiny rectangular-framed Tea Shades shielding your crimson orbs. But hey, it's still a cool air freshener!